In Maziacs, the hero must enter a randomly generated maze to find the treasure and bring it back safely to the exit. Along the way, he'll have to fight the dangerous Maziacs, spidery looking monsters which can only be safely killed if the hero has a sword. But also, he'll find help in the form of prisoners who'll show him the way towards the treasure (or the exit if he's already carrying it). 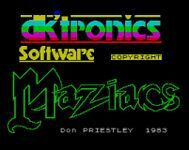 Maziacs was programmed by Don Priestley (who was famous for the huge sprites used in his Spectrum Trapdoor games and Popeye). It was based on an earlier design of his, Mazogs which was a ZX81 game.